Background: Trees often affect the chemical properties of soil, positively or negatively. Objective: This paper studied the effects of Podocarpus falcatus and Markhamia lutea trees on soil chemistry in Ruhande Arboretum, Rwanda. Methods: Soil samples were collected using Zigzag method from Arboretum forest of Ruhande at different depths (0-20, 20-40 and 40-60 cm). For each plot, 25 samples were collected to make one composite sample per plot for each depth. Results: The results showed that tree species contributed to the changes of soil chemistry along the depths of the soil layers. The laboratory analyses showed that there was a high significant influence of tree species on soil pH and Aluminum ions. 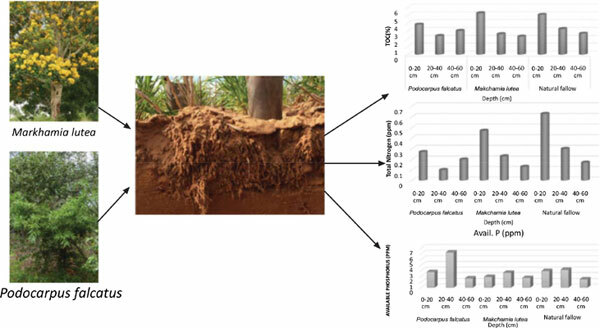 However, it was observed that there was no significant influence of Podocarpus falcatus and Markhamia lutea species on the available phosphorus or on the total exchangeable acidity. On the other hand, analyzing soil samples under Markhamia lutea showed an increase in the total nitrogen and a decrease in the pH and available phosphorus. Conclusion: Trees affect the chemical properties of soils. Therefore, it is recommended that under acidic soils, for example, forestry and agroforestry actors should use less acidifying tree species, such as Markhamia lutea and Podocarpus falcatus. Rwanda, Podocarpus falcatus, Markhamia lutea, phosphorus, exchangeable acidity, cation exchange capacity.